Hello readers! This postcard serves two purposes. First, it's appropriate because I myself have been missing from this blog for almost a week. There's no mystery or conspiracy; it was just a long week at the office. Next week might be even longer, with the kickoff of football season, and fretting over a certain volcano Bárðarbunga in Iceland and its impact on American football games in Ireland. But I'm going to try to get some posts written in advance. 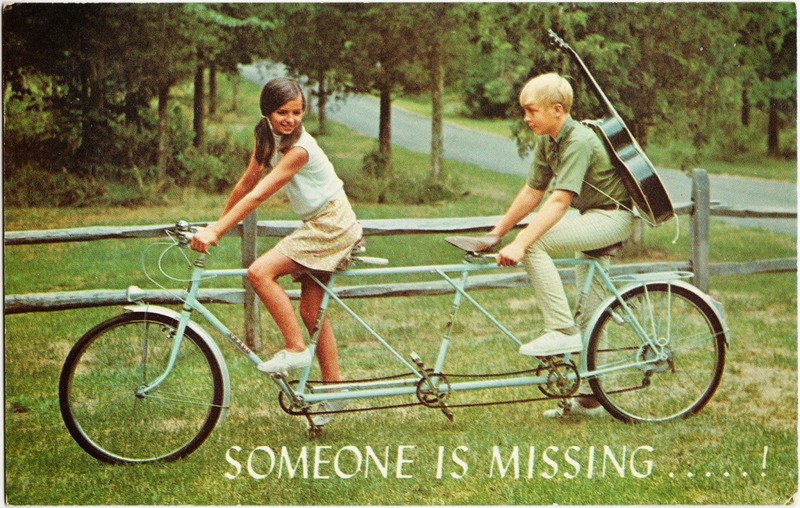 Second, it's a nice addition to Papergreat's collection of vintage "We Missed You at Church" postcards. This one features a "SOMEONE IS MISSING.....!" message and a picture of two riders on a three-person tandem bicycle.1 The text on the back of the card includes the King James version of Proverbs 22:6. The card was made in the United States and has never been used. 1. When I think of tandem bicycles, one of my first thoughts is of 2003's The Triplets of Belleville.